So you’re thinking of going up a gauge in string, eh!? You cheeky monkey!! 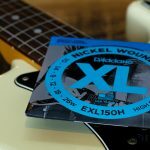 Going for a heavier gauge string is a common desire for many players. As we know, heavier strings can help deliver a “bigger and better” tone! However, before you run off, unwrap that heavier set and stick them on your guitar it’s worth being aware of the trade-offs that can come as result of your journey on the quest for heavenly tone!! Heavier gauge strings naturally have more tension in them when they are tuned to pitch. This means greater effort is required to play them in the form of fretting and bending, but it’s not just the player that feels the extra strain, the guitar is affected by the heavier gauge too. For example, if you’re changing from a 9-42 gauge to a 10-46 gauge set of strings, it may not sound like a big change, but the heavier 10-46 set carries over 20% more tension across the entire set. That’s a huge jump in tension! Your guitar will inevitably react to this extra tension and as a result you may notice changes in its playability. As you can see there’s a significant difference between the tension in the sets so you can start to get an idea of the level of extra strain placed on the guitar. Below we’ve compiled a list of some of the effects that may occur. We say “may” occur as not all guitars are the same. For instance, some older guitars are more delicate so could have a bigger reaction to even a small change in gauge whilst other guitars made from harder woods may show no signs of movement at all. The important thing to bear in mind is that it’s not until you put the new strings on that you will get to see just how much or how little adjustment the guitar needs as a result of the extra tension. With this in mind, this blog is simply meant as a primer on what you “might” see or “feel” happen. Also it’s worth pointing out that it’s not meant as an exhaustive guide on DIY repair so if you don’t feel comfortable carrying out any changes to your guitar yourself, we’d always recommend seeking the help of a qualified guitar technician or luthier…some shoddy work can often prove costly to repair afterwards. As you go up in string gauge, the extra tension will pull the neck up (forward). It is worth mentioning that if you are going down a gauge, you will often find that the effects will be reversed, so in this instance, the neck will move back. 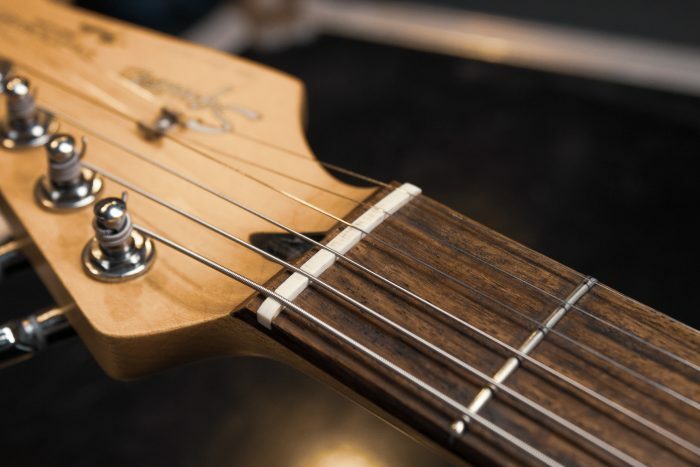 From a playability perspective, typical symptoms of a raised neck include a raised action (greater distance between the strings and the fretboard) meaning fretting the strings could prove more difficult. 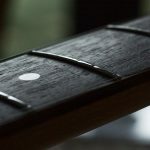 A raised neck can also affect the intonation, particularly if there has been a more drastic gauge change or more importantly if you are changing from a plain 3rd to a wound 3rd. The image above is a rather crude example of how your neck can react to the extra tension. If you can imagine the book is our guitar; the left half of the book is the neck and the right half is the body. An increase in gauge and tension will pull the neck up i.e. the left half of our book raises. As a result you can see that the action would increase and also some intonation issues can occur. In order to alleviate this issue, the truss rod will need to be adjusted. A tightening of the truss rod screw will pull the neck back down towards its original position (i.e. our book flattens out) and as a result it will help restore the neck relief to a pleasing level. Truss rod adjustments are one of those things that should be adjusted incrementally and can prove a little bit daunting. If done incorrectly it can prove costly so we’d always recommend consulting a qualified guitar technician or luthier to help give you some guidance or carry out the work for you. 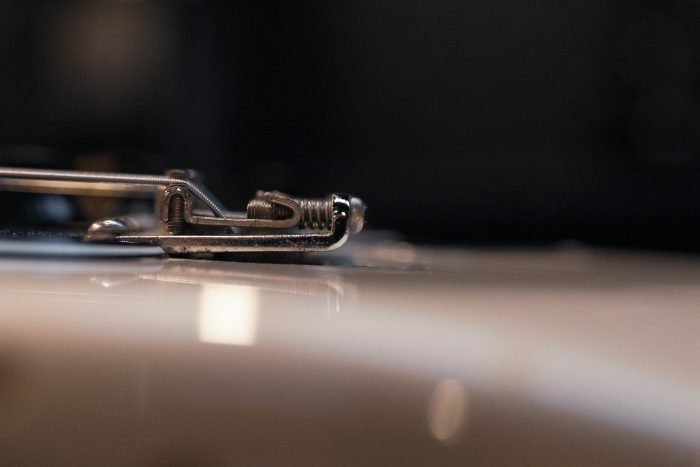 If your guitar is equipped with a tremolo bridge such as a Strat or if you have a Floyd Rose setup, you may find that there are some changes needed at that end too. The extra tension found in heavier gauge strings can cause a floating bridge to pull up/forward and tilt up away from the body. 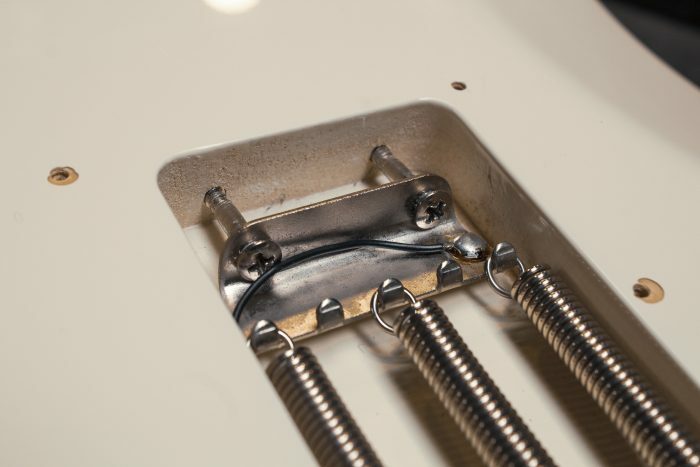 In order to counteract this effect, the screws that control the tension of the springs in the back cavity of the guitar will need to be tightened. This tightening causes the springs to pull the bridge back down towards the body which helps restore any string height and/or intonation issues that may have arisen. Depending on the extent of your jump in gauge, you may have to adjust the slots in your nut to accommodate the bigger string gauge. If your change in gauge is a drastic one, you may even find that a complete new nut is needed to be fitted. We’ve had instances of older nuts breaking as a result of drastic gauge changes, particularly on the thicker, low strings. Changing a guitar’s nut is not a drastic mod and pretty standard stuff and will help ensure the string slots are cut to the right depth but also maintain a decent string spacing too. 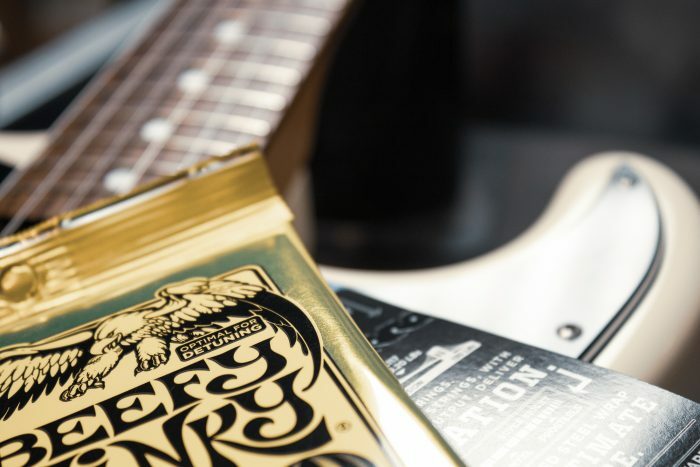 It’s particularly important to ensure the nut is checked if you have a tremolo equipped guitar as a “sticky” or ill fitting nut is a big culprit for tuning issues when it comes to these types of bridges. Q) Does the same go for acoustic guitars? More or less, yes! If you are going heavier on your acoustic guitar you can pretty much anticipate similar happenings with regards to your neck lifting up and an alteration or change of nut may prove necessary. Q) And what about Classical guitars? Classical guitar necks aren’t usually fitted with truss rods so making any adjustments through that means is not possible. 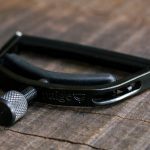 Classical sets made with nylon typically carry less tension than steel strings so even if you are changing to a higher tension set, it’s unlikely that you’ll notice any drastic changes to the way your guitar plays. Q) What if I’m not sure if a heavier gauge is for me? For some years now, some string manufacturers have been manufacturing what are known as half gauged strings. These are sets where the manufacturer has carefully chosen ‘in-between’ gauges to help make the step up in gauge less of a drastic one both for the player and their guitar, with little to no adjustments necessary. For instance, if you are making a change from a 10-46 to 11-49 gauged set, you may wish to select a gauge of 10.5’s. This smaller step-up in gauge will not only help the player but your guitar will be thankful too! These sets are readily available nowadays with many big name manufacturers such as D’Addario, DR, GHS, PRS and Pyramid Strings all making their own version of a half gauged set. The second option is to take your current set of strings and to tweak some of the gauges here and there to your taste. You can do this on an adhoc basis by purchasing some additional single string(s) and changing whichever gauge you want to. Alternatively, if you would prefer to create your own custom gauged set from scratch, you can definitely do this by making a set up from our large selection of single strings from brands such as D’Addario, Ernie Ball, Elixir, Rotosound and Martin to name a few. If you would like us to create you a custom gauge set, just drop our custom department. an e-mail and they’ll be happy to help you out. Also keep your eyes peeled for something exciting surrounding custom gauges in the coming weeks 🙂 You guys will be the first to know. We hope this has given you a better understanding of how your guitar can react to a change in string gauge. It’s often difficult to give a definitive answer and say “this will definitely happen” but it’s not as easy as that as all instruments are different and the jump in gauge will be different from player to player. If you would like any further guidance, please feel free to get in touch and we’d be happy to offer any advice we can. Happy stringing, and we’ll see you all next time! no adjustments needed. Have 6 more guitars to restring! Hi Marcus, thanks very much. Glad to hear that just by making that incremental jump in gauge, it didn’t have any real affect on your set up. Hendrix got GREAT tones out of 8-38. Neither Jimmy Page or Frank Zappa or Steve Vai have had their “tone” criticized. The heavier string is fine if you are going for a specific or “that” tone that SRV had. He had enormously powerful hands and frets like railroad rails. I returned to 9’s from trying 10’s on my LP Standard, and the rewards were immense but principally it gave me back the ease and range of huge bends which just increases my musicality. I recorded before and after and there’s hardly any discernible difference. A lot of the heavy gauge thing us just ridiculous macho posturing. 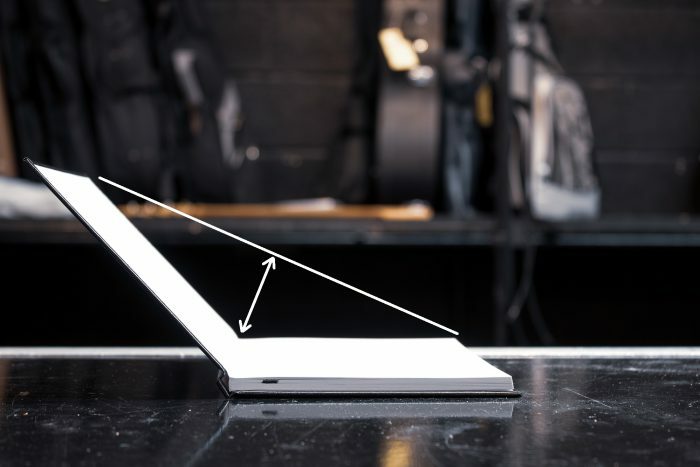 Stay light and keep access to wider and easier bends – and with them, greater ease of expression. Custom guage 11s on my blueridge dread.Perfect for fingerpicking/claw hammer style. Can bend them too!! Thanks for advice. 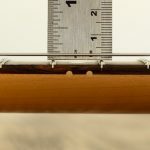 As a luthier I concur with this helpful advice – but add that, in the case of acoustic guitars, the potential impact of heavier string gauge is not limited to neck lift and nut adjustment/replacement. The most common impact of heavy string gauges on the acoustic guitars that I renovate and repair is belly bulge! The soundboard becomes distorted (lifts) in the area just behind the bridge – raising the rear of the bridge, reducing the string break angle over the saddle, and resulting in unplayable high string action over the fretboard. Do different scale lengths prefer heavier or lighter strings? Thanks for a comprehensive view of this interesting and important topic. One aspect that I’d like to understand better is the effect of different tunings though, in particular tuning down. I normally play 10-46, standard tuning, but I’m planning on tuning of my guitar down to D and/or C. How much should I increase the gauge to get the same tension? If I’d go down to B I can of course look at string 2-7 of a seven string set to get an idea. But generally, what does a half step or whole step down mean for tension? Hi Stefan, thanks for the comment. If you’re looking at dropping the 6th string down in pitch then the tension of your standard .046 string will in turn drop too and feel a bit ‘looser’. If you drop the tuning too far on the .046, it will become too floppy and won’t sound great at all. 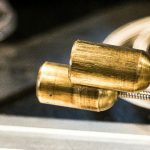 If you’re looking to maintain a similar tension to your .046 in standard tension these gauges may help as a guideline. Of course, there’s lots of singles on the market in between these gauges so feel free to tweak them to see what suits you best. Hope this helps, as always, feel free to message us if you wanted any further guidance.